This year Mathematics Mastery is taught in Year 3 and 4. The children in LKS2 have a daily 1-hour maths session, followed by a 10-15 minute maths meeting in the afternoon. Our maths meetings are focused on mathematical concepts that need to be revisited throughout the curriculum. We engage all learners with songs, chants, problems and questions. In LKS2 children have a 1hour literacy lesson. 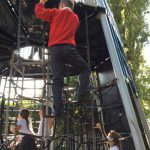 Within these lessons, children are taught a range of genres in accordance with the National Curriculum. Every lesson starts with children practicing their keywords and handwriting, followed by a grammar activity. 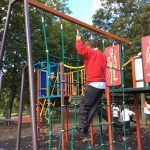 Each lesson focuses on exploring the genre being taught, how to use this to plan their own writing and finally edit their own writing. LKS2 children have a 10-minute spelling/phonic session later in the morning, where the children learn about the spelling rules or phonics code being taught in that week. Children participate in understanding the spelling rule, use dictionaries to find definitions, add the relevant rule (prefixes or suffixes) to root words and spot the mistake. 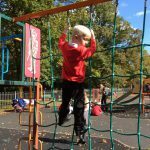 Each week children are assessed on the new spelling rule or phonic code with a spelling test. Grammar is taught through out the week and where necessary to embed the relevant grammar element for their writing. Children have been improving their own writing using checklist and success criteria. Pupils are encourage to edit their own work with brown /pink pens and peer support each other to be better writers. The children write in many different genres based on our topic theme. In LKS2 children like the whole school are expected to read 3 times a week to an adult at home. The ‘Reading Rainbow’ challenge we have promotes children to read more at home and in school. Children record their reading in their reading challenge book, gain stickers and certificates for every 4 weeks of reading and move along the reading rainbow from the cloud to the pot of gold. Children read with an adult two to three times a week in LKS2, 1:1, in small groups or with the teacher in guided reading. Following the ‘Cornerstones Curriculum’ we develop on the topics taught in KS1. We follow the creative curriculum based on the 4 stages; engage, develop, innovate and express. This topic is based heavily on science. 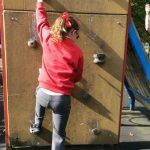 The children enjoyed going to the park to explore forces (push, pull and friction) and carrying out different investigations in the classroom. Last half term we learnt about forces and robots. We visited a robot exhibition at Kirkleatham Museum. Whilst at the exhibition, the children learnt lots of new facts about the robots and sketched their favourite one. 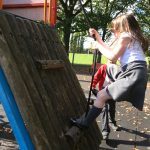 The children learnt about forces and carried out many science investigations. 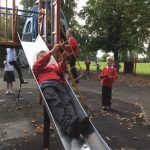 We went to the park to explore which forces we use on different equipment and investigated whether the type of material effects how fast an object travels down a slide. As part of the topic, the children read and explored different books about robots. The children also had the opportunity to write stories, non-chronological reports, descriptions and poetry based on the topic. To view our current homework on Scrumdiddlyumptious please click here.